I don't know if you have seen or heard about these, but at first glance they aren't the MOST attractive shoe in the world. I've been wanting these for a little while, but I just haven't pursued this purchase. I see people wearing them, and the more I see them, the more they grow on me. If you haven't heard about these shoes, or know what their purpose is, please go to their website and read about them: http://www.toms.com/our-movement. Once I read about them, my heart decided that I have to have some. I just found your blog and I love it! Your wedding pictures are precious! 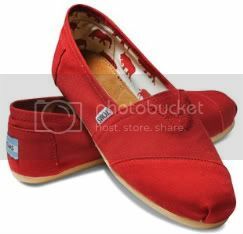 About the toms, I have the red and white striped ones like the pink and white ones you want. And soon after I got them the braided sole started messing up.. Just letting ya know. I love Toms and they are so comfy! I like the red or the yellow ones! I like the pink ones! I like the sole on them! I'm a new follower and your blog is too cute! I like the pink the best! I have a hard time deciding too! I think the baby blue ones are cute, and the red!